Most of us would consider the ramp to be a place where we picture beautiful models walking, wearing exclusive designer wear. Well, not anymore. With coming in of modern retail, a lot has changed in matters of marketing strategies, brand building initiatives, advertising themes and so on. The ramp is no longer an exclusive domain of designers alone. Many national apparel brands are turning to ramp shows to showcase their collections to garner more footfalls and grab positive attention for their brand. Just as successful designers do not depend solely on the ramp shows for their survival, and invest in boutiques and designer outlets; taking a cue from them, brands like Provogue, Scullers, Color Plus, Sisley, Benetton, Allen Solly are participating in either fashion weeks or organise their own ramp shows to exhibit their apparels. Roping in ace choreographers and fashion consultants, apparel brands are successfully revamping their look, and in style. Hasbro Clothing, launched its revamped retail label ‘Basics Life’ which caters to menswear through a high-octane fashion show choreographed by famous fashion guru, Prasad Bidappa. Cashing-in on the popularity of famous child actors like Darsheel Safary (Taare Zameen Pe) Rubina Ali and Azharuddin Mohammed Ismail (Slumdog Millionaire) clothing brands like Catmoss and Unikid have tied-up with them for walking the ramp in their creations in order to leverage the brand’s popularity. Recently, Unikid, an international kids wear brand hosted a kids wear fashion show competition at their store. The ramp was a star-studded affair with Slumdog Millionaire child actors Rubina Ali and Azharuddin Mohammed Ismail. Catmoss, a retail brand for children also unveiled its autumn-winter collection by organising a fashion show. What works well because of these ramp shows is that the brand gets the image of ‘wearable-fashion’. 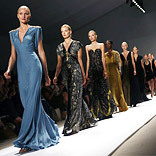 It is usually considered that clothes worn in fashion shows by thin and svelte models are rarely wearable by you and me. This myth is successfully crushed when a familiar brand holds a ramp show and the customer is able to purchase that garment (and feel the glee of having a ‘modeled’ dress). The influx of ‘Fashion Weeks’ has also, in a way, coaxed clothing retail brands to become a part of them, though not many have broken through the glass ceiling of fashion designers. Retail brands prefer holding their own fashion shows to showcase their collections. Salil Chaturvedi, Deputy Managing Director, Provogue India adds, “Actually we don’t do ramp shows at India’s Fashion Weeks. Our shows are special events designed around the launch of our own collections. We’ve considered being part of Fashion Weeks, but as yet we haven’t taken that path. So far we’ve built our brand independently but we might look at doing this in future.” Pantaloons also organised a fashion show to promote its collections recently. The cast of the movie ‘Jail’ walked the ramp and added a touch of bollywood to the fashion show. The promise of glamour attached to a ramp show is a key propellant for apparel brands to organise fashion shows to showcase their collections. There are no limits to innovating for increasing sales and if fashion shows happen to be the call of the hour then why not.